Culwulla Chambers is a twelve storey commercial office building with this frontage to King Street and another to Castlereagh Street. This heritage listed building was designed by Spain, Cosh & Minnett and built in 1912 in the Federation Free style. 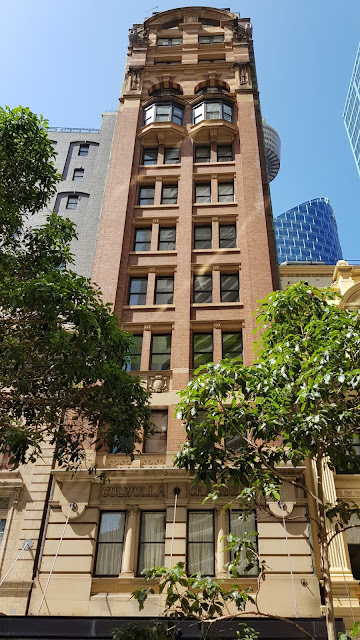 At the time of its construction, it was Australia's tallest building and was a catalyst for the 1912 Height of Buildings Act and resulting conflict between State and Local Government over the power to regulate Sydney's development. The act was repealed in 1957 and it remained the tallest building until 1961. It was built for Dr Herbert J W Marks and his brother Walter Moffitt Marks who lived at Culwulla at Darling Point, named after the family property at Jamberoo called Culwulla. I wonder what position it holds now in the rankings of Sydney's highest buildings. Quite low in the rankings I imagine since the top 35 list features building 31 storeys and above. Handsome building with a dapper design. Those bay windows are a feature of the Federation style.